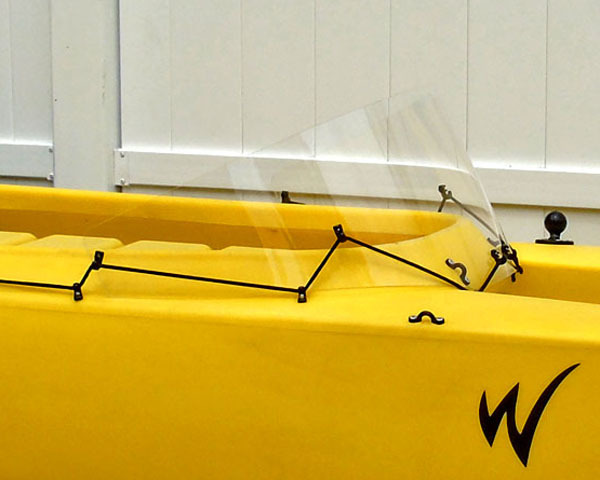 Wavewalk kayaks come with flotation that makes their recovery easier. 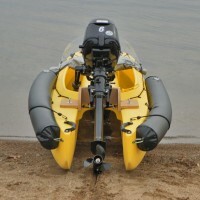 The W700 and S4 feature a watertight saddle that provides 180 lbs of positive flotation, and the W500 is offered with detachable foam flotation modules. Berny named his DIY Wavewalk “Banana Split”, and his boat’s dimensions and load capacity are comparable to those of the 700 series. In this video, Berny hops into the cockpit directly, in a straight angle. It’s also possible to get in from a sharper angle, in a position that’s more aligned with the boat, as well as climb in from the rear. Note that if there is some water in one of the hulls, the extra weight on that side can make reentry easier if you do it from the other, lighter side. We’ve decided to publish this video for the benefit of our clients who dive and practice spear fishing. 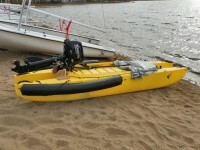 Why overpower this fishing kayak with a 6 hp outboard motor? 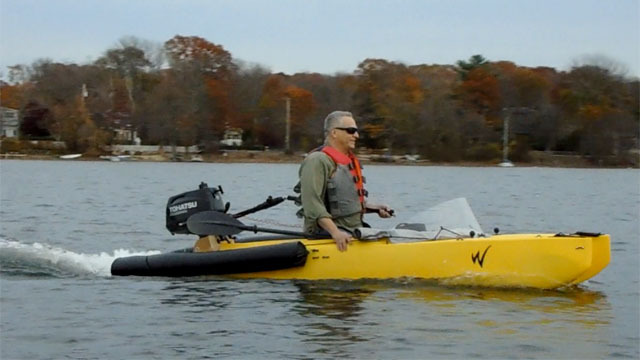 Earlier this year, Kenny One-Shot Tracy outfitted his W500 kayak with side flotation and a 6 hp Tohatsu outboard motor, and showed it going at 13 mph. This was intriguing, and several months later, after we came up with the W570 series for offshore fishing, we wanted to test it with a similar motor. 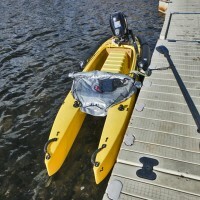 A W kayak weigh 60 lbs and it’s rated for 2-3 hp motors, so it goes without saying that using it with a 6 hp motor means overpowering it, since these motors are rated for moving boats up to 3,000 lbs, that is 50 times heavier. However, testing and experimenting are part of any Research and Development (R&D) process, and we try as much as we can to test our products under various conditions in order to better understand possibilities, problems, and hazards, and inform our clients about them, so they have more options to choose from, and can make better decisions. Tohatsu America showed interested in this project and cooperated with us through their dealer Steve’s Marine in Rhode Island, and we got the 6 hp Tohatsu motor (20″ shaft) in late October. 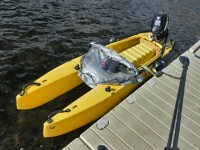 Although the 6 hp (20″ long shaft) Tohatsu is a sophisticated outboard motor, it is relatively lightweight for its class. However, at 59 lbs it still weighs twice more than the 2-2.3 hp Honda outboard that we’ve routinely used so far. This additional weight was our first concern, and we wanted to experience what it means for a W kayak angler who uses such a motor. We found the weight difference to be noticeable, but not a major issue – It’s possible to carry such a motor over short distances, whether on its own or mounted on the kayak. 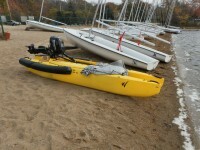 Dragging the kayak on a sandy beach was considerably more difficult, but not a big problem over a short distance. Lifting the motor into the car wasn’t too hard either. 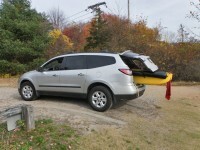 The boat fits inside the SUV with the flotation and spray shield on, and the motor dismounted. Launching is easy both from the beach and from a dock, and the same is true for beaching. W570 with spray shield and cockpit cover. Kenny reported that his 6 hp Tohatsu outboard had broken a DIY motor mount. Such accidents can be dangerous, so we knew that we had to consider both weight and power. Kenny later reported that his 6 hp motor worked with the TMM 20 motor mount that we had sent him, but we preferred to beef up a TMM 20-15 motor mount with an additional 3/4″ board for its vertical mounting plate, making it 1.5″ thick. Another concern we had about the 6 hp motor’s weight was how our W570 would take it. Rear view of a docked Wavewalk 570 INF 20-15 outfitted with both a spray shield and cockpit cover, and an extra inflatable flotation module attached between its hulls. Driving the boat with the 6 hp Tohatsu / 20″ shaft was easy and convenient. This outboard motor features a 3 position gear system (Forward-Neutral-Reverse) that’s safer than a centrifugal clutch, and makes it easy to start any time. The fact that this motor is water cooled makes it relatively quiet in comparison with the air cooled 2-2.3 hp Honda. Access to the motor’s controls is easy and convenient once you slide backward on the saddle all the way to the back of the cockpit. The inflatable flotation modules stayed above waterline and did not cause splashing. 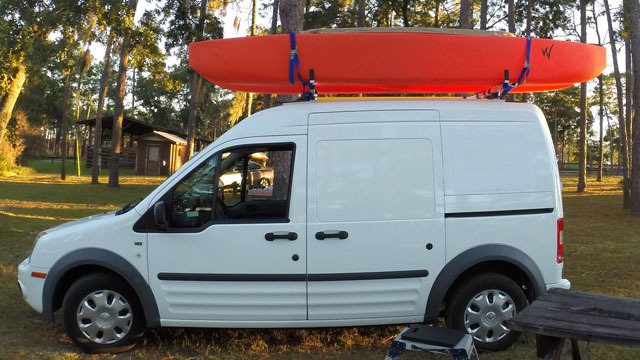 Although a W kayak can carry heavier loads, we rate these kayaks for a total load of 360 lbs, for both safety and performance reasons. This number includes everything that the boat may carry, from passengers and their personal belongings to fishing gear, an anchor, and last but not least – a motor. With a 60 lbs motor and all the extra accessories that come with the Wavewalk 570, and considering the high speed in which you’re likely to drive, it would be safer to consider the W570 as a one-person motorized kayak, or a solo skiff, if you prefer. This is unless the user is not heavy, and they take a lightweight passenger on board. For example: A driver that weighs less than 200 lbs could take on board a small child weighing 60 lbs, plus some lightweight fishing tackle. The 6 hp Tohatsu outboard model that we’ve tested features an integral fuel tank that allows it to go for 45 minutes full throttle, but as long as you drive a W570 with it you won’t go over 1/3 throttle since doing so is likely to increase your speed dangerously, unless you’re towing a bigger boat or several kayaks and canoes. In one occasion, while the boat was going pretty fast, the propeller hit a rock on the bottom of the lake, and got ejected out of the water, as it’s designed to do in such cases. Lowering it back into the water presented no problem. The reinforced TMM 20-15 transom mount didn’t budge, and the inflatable side flotation proved that it’s useful in helping to prevent the boat from rolling (flipping) if it’s tilting strongly as it did following the impact and momentary loss of control that resulted from it. The role that the inflatable flotation played in that accident emphasizes its importance. 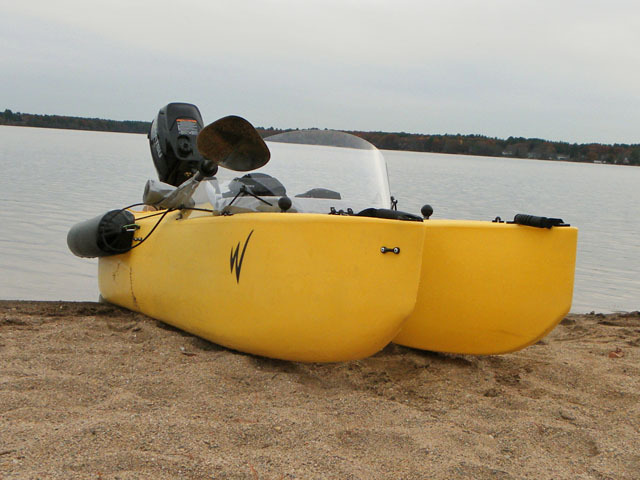 A W kayak outfitted with a 2-2.3 hp outboard can go at 8.5 mph, full throttle, while the same kayak outfitted with a 6 hp Tohatsu motor can reach 13 mph at 1/3 throttle, a speed that for most people makes it too much of a challenge to drive safely. This is where we found that a 6 hp motor wasn’t the best fit for the Wavewalk 570. In other words, overpowering the W570 with such a powerful motor can be hazardous and cause accidents if you drive too fast relatively to your boating skills and/or to water conditions, or if you accidentally accelerate abruptly or even just too quickly for you to safely maintain control over the vessel. This lightweight craft is no match for the power and torque of such a big engine, and that makes it too ‘nervous’ compared to when it’s outfitted with a smaller and less powerful motor that tks longer to accelerate. Having said that, you might like this overpowered configuration if you’re a risk-loving speed fan who enjoys the feeling of danger. It’s your choice, as long as you’re aware of the safety hazards, and you know that the W570 isn’t rated for motors that are more powerful than 2-3 hp. A more productive way to make use of such a disproportionally powerful motor could be for towing other boats. For example, if you use the W570 as tender (auxiliary service boat) for a bigger leisure craft such as a sailboat, it could tow the mother ship, if necessary, or tow another tender with several passengers and provisions on board (e.g. 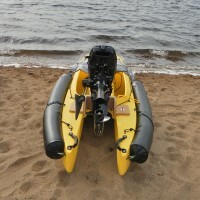 an inflatable dinghy). If indeed you’re thinking about such use, make sure the towed craft are properly attached to your W570, and don’t use its handles or eyelets for this purpose. Similarly, if you go on a camping and fishing trip in which several people take part, your W570 on steroids could tow several kayaks and canoes over long distances, and make life easier for the other members of your expedition. 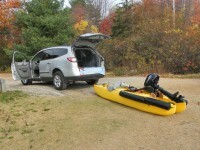 If you’re thinking about driving up fast rivers, such as in springtime, or on fast tidal rivers, more power and torque may be justified, although it’s hard to imagine cases where a 2-3 hp motor would not suffice for your W kayak. Just remember that fast moving rivers are hazardous, and we recommend neither paddling nor motorizing in them. Another case in which you could be interested to use a 6 hp outboard motor with your W570 is if you already own a larger boat that you propel with such a motor, and you want to alternate between your W570 and that bigger boat. For example, you may prefer to go fishing on your own in the W570, and take the bigger boat when you fish with your family and friends. If you don’t like to purchase a smaller outboard for your W570, you could try using your 6 hp outboard with it, and see how it works for you. If it does, it could save you the additional expense on a small motor. Just remember to be very cautious with the throttle when the motor is mounted on your W570. All the above said does not imply that we rate the W570 for use with an outboard motor that’s more powerful than 2-3 hp, because we don’t. 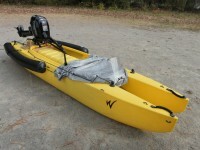 We think that using a W kayak with motors that are more powerful than 2-3 hp could be hazardous. Again, the purpose of this article is to inform people about what using much stronger motors implies, and warn them about problems and dangers associated with such practice. When observing fishing kayak design developments in recent years, it’s impossible to miss two main trends that seem to have gone out of control: The first is an increase in size and weight, and the second is over accessorizing. One company recently launched a tandem fishing kayak that weighs 185 lbs in the basic version, and 230 lbs when fully accessorized. And if you think this weight includes a powerful outboard motor, you’re wrong – We’re still talking about a human powered boat, (although not a paddle craft) that’s too wide for paddling… At such weight, a crew of two strong anglers couldn’t car top this kayak, and they’ll even have a hard time loading it on top of the trailer that’s offered with it. The thing looks like it came out of a shipyard rather than a kayak factory… Good luck with moving that object out there, on the water! The new SOT and hybrid fishing kayaks’ decks are so overcrowded and over accessorized that some of them severely limit the user’s range of motion in fishing, and they restrict even their legroom. 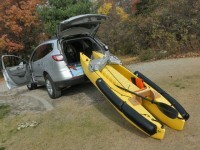 Some of those fishing kayaks look bizarre, or comic, with such a plethora of useless objects (e.g. leaning bar), semi-useless objects (e.g. cup holder) and overly complex ‘systems’ (e.g. double-cover storage hatch) crowding their decks and getting in the way of their users’ arms and fishing lines. And since this article is about innovation, we feel obliged to mention the new, award winning electric fishing kayak that features a motor installed in its middle. Its propeller shaft comes out of the water between the angler’s legs, with the propeller appearing at a couple inches distance from their crotch. Good luck with that too! 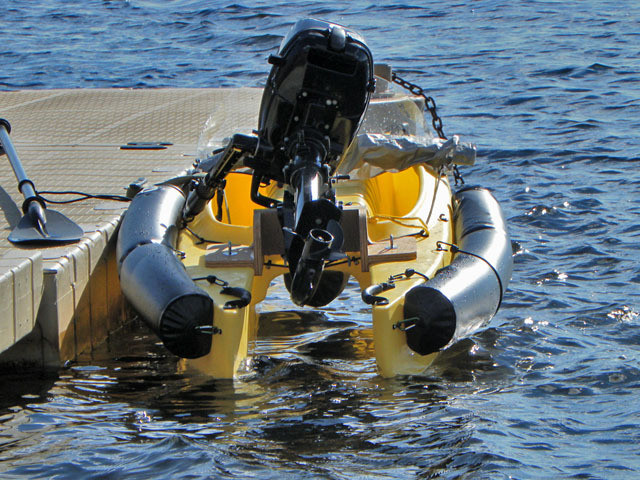 Wavewalk launched three new products in 2014: High-buoyancy Inflatable detachable flotation modules, a detachable, transparent Spray Shield, and a dual use Transom Motor Mount. These accessories strengthen our advantage in high performance motorized kayak fishing, which is significantly different from traditional motorized kayak fishing involving outfitting SOT kayaks with weak and unreliable electric trolling motors for short distance, flat water trips. A W500 outfitted with proper flotation and a powerful outboard gas engine offers a solution to the problems of strong tidal currents, wind, and the need to travel long distances in moving water, including offshore. 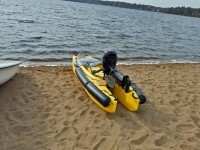 This new accessory transforms the W kayak into a Rigid Inflatable Boat (RIB), an increasingly popular high-performance class of watercraft used in a variety of motorized boating applications ranging from tendering bigger boats to high speed travel, diving, fishing, and rescue operations. The new inflatable float provides twice as much buoyancy as the large size Polyethylene foam modules we offered so far. 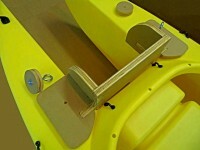 Thus, it improves the motorized W kayak’s performance in terms of both capsize prevention and recovery. A W500 can be outfitted with either one or two pairs of such floats. In the two-pair configuration it isn’t suitable for fishing, and you need to stop somewhere and relocate the front pair – either by reattaching them at the rear, or just storing them in the kayak’s hull tips behind you. Another great feature these floats have is that you don’t need a pump to inflate them. This accessory works to prevent spray from getting into the cockpit of the W500 while motorizing at high speed in choppy water, or in waves. 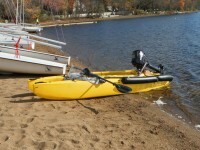 The reason it’s detachable is that you may want to have it out of your way when you fish – Casting and landing fish from this kayak’s front is not only easy, but it also has some advantages, so you may want to quickly detach this spray shield and store it (flat) in one of the hull tips behind you. Reattaching it is easy, and takes less than a minute. 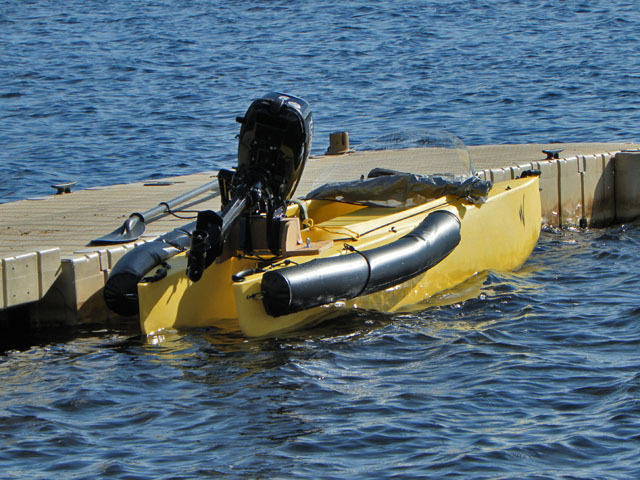 Outboard gas motors and electric trolling motors come in two basic configurations – Long propeller shaft (20″ and above), and short propeller shaft (15″). This can be a problem in case you have a long-shaft outboard motor and a short shaft electric motor, or vice versa, and you want to use them in different conditions. For example – travel fast to a distant fishing area using the powerful outboard, and once you get there troll slowly and quietly using the electric motor. You may also want to use the outboard motor when you fish offshore, and the electric trolling motor when you fish inland, in smaller bodies of water, or in no-motor zones. Either way, you’re fully covered now and in the future with the new TMM 20-15 Transom Motor Mount. This new motor mount is not only more versatile – it also weighs less than the old mounts. 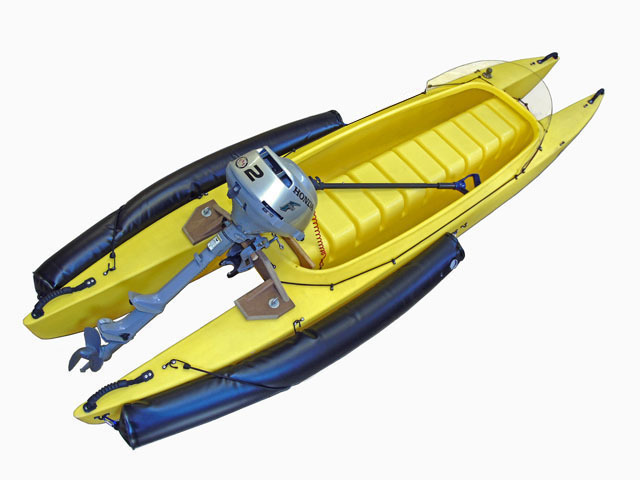 Note that a W500 kayak outfitted with high-performance inflatable flotation and a powerful outboard motor still weighs less than some of the mammoth ‘barge’ fishing kayaks out there that feature no motor at all. In sum, while Wavewalk keeps expanding the performance envelope of its already superior products and solutions, other fishing kayak manufacturers still have nothing interesting or sensible to offer, but they seem to put more effort into it in recent years.